In the middle of Western North Carolina sits one of the state’s most potentially dangerous time bombs. And, at any given moment, under the right circumstances, it could go off. Despite North Carolina’s requirements that school-age children have up-to-date vaccinations before starting kindergarten, 5 percent of Buncombe County’s kindergarten population remained unvaccinated for the 2014-15 school year. Statistics for the 2015-16 school year are not yet available. According to Dr. Jennifer Mullendore, medical director for Buncombe County Health & Human Services, the percentage is higher than previous years and is six times the state average. With up to 20 percent of each of the county’s schools allowed to be unvaccinated, the possibility exists for a significant public-health crisis, she said. “We’re holding our breath, waiting for an outbreak,” she said. Buncombe’s 2,488 kindergarteners, one has a medical exemption, including a waiver from a healthcare provider, and 125 opted out for religious reasons. Or at least that’s officially what they claim. The state does not offer a philosophical exemption, even though that’s exactly what some anti-vaccination groups in Buncombe Cuonty have advocated. It’s likely that not all “religious” waivers are faith-based. Upon kindergarten enrollment, parents must present schools with their child’s official immunization record. Schools keep these records on file, including any medical or religious exemptions. Children without exemptions have 30 days to provide proof of immunization or they aren’t allowed to return to school. In addition to Buncombe County, Polk County and Transylvania County round out top three WNC locales with the highest non-vaccinated rates, reporting 4.71 percent and 2.89 percent non-vaccinations, respectively. Henderson County has the second highest total number of children without vaccinations — with one medical waiver and 14 religious exemptions. However, because this is a relatively large county for WNC, it’s rate is not especially out of the range seen in most counties across the state. Although no widespread outbreaks have occurred, Buncombe frequently experiences a higher-than-average incidence of pertussis, also known as whooping cough, a highly contagious respiratory disease known for uncontrollable, violent coughing that makes it hard to breathe. Despite being preventable with a vaccine, in 2014, Mullendore said, the county had 65 reported cases. Only Duplin County, a rural county near the coast known for its pig farms, had more with 138 cases. There were 782 cases of whooping cough reported statewide in 2014. But, knowing the reasons behind the high non-vaccination rate is difficult, Mullendore said. “We suspect immunizations have done a great job keeping people healthy for 50-plus years, and people don’t have context for why immunizations are important,” Mullendore said. Immunizations for North Carolina’s children are free through the Vaccines for Children program, even for uninsured individuals. It’s possible, though, other factors that typically limit access to healthcare are also at play, including cultural or language barriers that make it difficult to take advantage of healthcare services, and, in this case, a low level of education about vaccines. Tara Rybka, public health educator with the Transylvania County Public Health Department, said that although it’s never been directly connected to a lack of immunization, transportation difficulties frequently play a role in limiting access to healthcare services in counties like hers. In many cases, Mullendore said, parents research vaccines on their own, trusting potentially non-vetted, online sources rather than asking their pediatrician or other healthcare provider for information about possible risks and benefits associated with vaccinating their children. Some choose not to vaccinate based on their online findings, leaving the overall community more vulnerable to preventable disease. Doing so is particularly dangerous, said Noel Brewer, associate professor of health behavior at the University of North Carolina at Chapel Hill Gillings School of Global Public Health. Vaccines provide herd immunity, he said, protecting the vaccinated and sheltering those who can’t receive vaccines due to conditions that compromise their immune systems, such as cancer. On the flip side, however, non-vaccination can also create herd sensitivity, a phenomenon that gives rise to more severe cases of disease as individuals get sick at older ages. Since most people are vaccinated, the risk of herd sensitivity might not seem too bad. But Brewer said this perception is misleading. Even with the risks of non-vaccination publicized throughout the healthcare community, Buncombe County has a relatively active anti-vaccine cohort, including Moms Against Mercury. Based in Leicester, this organization, which did not return calls for comment, publicizes and supports the belief that mercury present in vaccines adversely affects the nervous system. In recent years, the group has held six rallies, lobbying against the use of vaccines in their current forms. According to the Centers for Disease Control & Prevention (CDC), though, the type of mercury used in vaccines – ethylmercury – is metabolized and cleared from the body far faster than the type of mercury – methylmercury – present in some types of fish. Consequently, CDC data states, ethylmercury is far less likely to be harmful. County health officials are working to combat anti-vaccine efforts, Mullendore said. Last year, the Department of Health & Human Services worked with healthcare and childcare providers to expand educational services around the facts and benefits of vaccinating children. Rather than targeting staunch anti-vaccine proponents who tend to dig their heels in when faced with information that contradicts their beliefs, health officials are reaching out through public forums to parents who are curious about vaccines. The effort could ultimately influence those who are on the fence about whether to vaccinate to proceed with immunizations. Jennifer Garrett, director of nursing with Macon County Public Health also suggested holding school-based vaccination clinics to reach students who aren’t yet vaccinated. Macon’s health officials also reach out via phone to non-compliant parents to set up appointments for children to be vaccinated. Ultimately, though, UNC’s Brewer said, the onus is on parents in communities with unvaccinated children to take steps that will side-step exposure to preventable disease. When children are sick, keep them home from school, he said, and know which pediatricians still choose to treat children who don’t have current vaccinations. And, Brewer added, public health officials should continue to push for more widespread vaccinations. “Getting information into the hands of those who are vaccinated can be helpful,” he said. New research on the timing of potty training shows problems for pushing children too soon or waiting too long. The frustrating journey of toilet training a child is a struggle every parent faces. Starting kids down this path early can be tempting, but a new study from Wake Forest University found that pushing the topic too soon – or too late – can cause physical problems and lead to wetting accidents. Children who are toilet trained prior to age 2 or after age 3 have significantly more daytime and nighttime accidents than children trained between the two ages, the study showed. As long as a child stays in diapers, his or her bladder continues to grow in size. Being able to urinate freely increases the bladder’s fluid capacity and actually helps it learn to function more effectively, he said. Once toilet training is introduced though, that growth stops. So, according to research from the University of Oklahoma Health Sciences Center, children who toilet train earlier will automatically have smaller bladders, potentially setting them up for future toileting problems. But the real culprit behind wetting accidents, Hodges said, is constipation. Increased fullness in the bowels presses on the bladder, making it harder for children to control the flow of urine. Over longer periods, that same fullness can also stunt the bladder’s growth, further inhibiting capacity. In addition, the muscles used to restrict bowel movements are connected to muscles that control urination; constriction can make it harder for children to learn proper toileting behaviors. This study is the first research to connect constipation to wetting accidents in younger children. In some cases, constipation occurs when a child resists parents’ efforts to introduce toilet training. Other times, outside influences, such as a new sibling, can stall a child’s progress. Hodges’ team followed the toileting habits of 112 children aged 3 to 10 for six months. The majority were toilet trained between ages 2 and 3, and parents reported 38 percent had a history of constipation and 45 percent had experienced daytime wetting. Although anecdotal evidence shows girls can toilet train earlier and easier than boys, Hodges’ research found being male didn’t increase the likelihood of constipation or daytime wetting. According to the findings, the children who toilet trained before age 2 were more than three times as likely to suffer from constipation than children who trained between ages 2 and 3. Children who trained after age 3 experienced constipation seven times as often. In addition, when compared to other children, kids who trained early and late had daytime wetness nearly four times and five times as often, respectively. These problems can frequently be overlooked, said Triangle Center for Behavioral Health clinical psychologist Rebecca Dingfelder, because parents aren’t comfortable broaching the subject with their child’s physician. Dingfelder has expertise in working with children who have toilet-training difficulties. It’s important to remember, Dingfelder said, that children develop at their own paces. Currently, the N.C. Department of Health & Human Services – the agency that oversees day-care center licensures in the state – doesn’t require that children be toilet trained by a certain age in day-care or pre-school environments. However, many such facilities maintain a policy that children must be fully trained before progressing to a 3-year-old classroom. In some cases, she said, that mandate puts unrealistic expectations on the child and family. “If a child is cognitively and socially ready to move on, and if toileting is the only thing getting in the way, then day-cares need to cooperate with families to see how they can make it work,” she said. For example, if day-care facilities don’t have a changing table in the older classes, then arrangements could be made for the child to return to the younger class for diaper changes. Ultimately, Dingfelder said, she hopes Hodges’ research will relieve much of the stress and anxiety parents feel around toilet training their children as soon as possible. Toilet training isn’t a race to the finish line, she said, and parents shouldn’t feel pressure to push their toddlers too soon. When it comes to reading, teachers re-tell the same stories year after year. One student holds a book inches from his face and requests to sit in the front row. His sister seems perfectly content in a desk toward the back of class and can easily read papers at arm’s length. It’s not uncommon for children to have varying degrees of eyesight. But is such a big difference normal among siblings? The reasons why one child inherits a parent’s nearsightedness while another offspring has perfect vision have long been fuzzy. Now, new research out of Duke University is bringing some clarity to this puzzle. eye is either oval-shaped (rather than round) or the cornea – the transparent covering over the front of the eye – is too curved. In either case, the eye is unable to properly focus the light coming through the pupil. 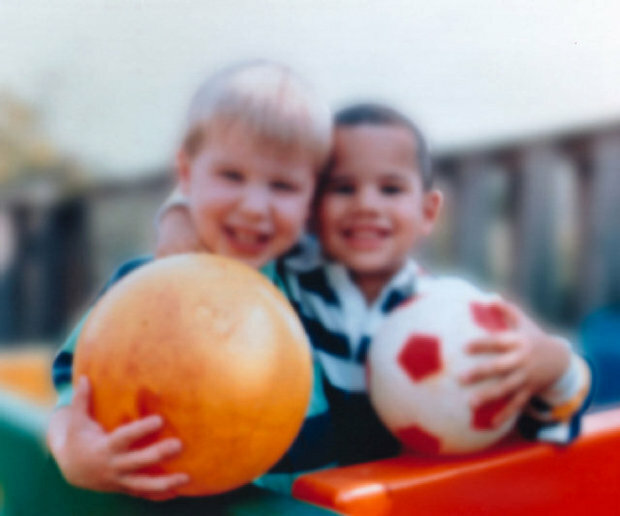 The result is blurry vision, meaning a nearsighted person must stand closer to an object that a normal-sighted person in order to see it clearly. For example, a nearsighted person must stand 20 feet away from a street sign to see it as well as a normal-sighted person can at 40 feet. But, according to research published in the American Journal of Human Genetics, the genetic cause behind myopia could now be a little clearer. Duke researchers found that a newly-identified genetic mutation that affects copper metabolism and oxygen regulation in eye tissue is a culprit in cases of severe myopia. High-grade myopia is inherited and occurs most commonly in Asian cultures. But it also affects nearly 2 percent of nearsighted Americans, increasing their risks for additional eye problems, such as detached retinas, cataracts and glaucoma. Several myopia-associated genes have already been discovered, but this one – SCO2 – is particularly important in the study of high-grade disease, said Terri Young, M.D., an ophthalmology, pediatrics, and medicine professor at Duke. When functioning properly, SCO2 helps metabolize copper, an element vital to controlling oxygen levels in eye tissue. A malfunctioning gene can allow oxygen levels to rise too high, increasing stress on the tissue. These high levels can, ultimately, alter the eye’s development and function, she said. To find genetic mutations common among individuals with high-grade myopia, Young and her colleagues within Duke’s Eye Center, Center for Human Genetics, and graduate medical school in Singapore analyzed DNA extracted from the blood and saliva of four individuals all from the same 11-member American family of European ancestry. Her team used a new sequencing method – next-generation sequencing (NGS) – to produce large, more precise quantities of data. NGS enables researchers to sequence larger numbers of DNA pairs faster than when using the more traditional method, electrophoresis. The team also found three additional SCO2 genes mutations in an additional 140 people. After identifying the SCO2 gene mutation in human eye tissue, researchers explored the gene’s expression in mice to further confirm their findings. They induced nearsightedness in otherwise normal-sighted, newborn mice by putting a translucent contact lens over one eye in each animal. After six weeks, they analyzed the eye tissue to see where SCO2 was most expressed, and in this case, mutated. By attaching a stain to the gene, they found these genes were most expressed in the retina – the tissue where the eye actually sees images – and the white, protective part of the eye called the sclera. Combining the results from both human and mouse eye tissue analysis highlights the existing connection between low levels of copper in the body and eye disease, she said. If that’s the case, she said, taking copper supplements could conceivably slow down or stop myopia’s development. Even though malfunctioning SCO2 has a significant, negative impact on eyesight, it is likely a very rare mutation, Young said. So, rather than test for it alone, her group plans to add it to a panel of studies known myopia-associated genes. Additional work is also ongoing, exploring the impact an SCO2 mutation could have outside of eye disease. According to Dennis J. Thiele, Ph.D., a pharmacology and cancer biology professor at Duke who wasn’t part of Young’s team, one of the SCO2 mutations is pivotal in a deadly form of cardiomyopathy, a condition that causes the heart muscle to weaken and eventually leads to heart failure. Because this gene mutation can affect multiple body systems, it’s important for investigators to continue their explorations, said Gary Heiting, a practicing ophthalmologist in Minnesota, as well as the editor of All About Vision, an online eye-education publication. Knowing more about SCO2 will help scientists and doctors better understand how much of eye health is inherited and how much is cause by day-to-day activities. For one 12-year-old girl, the taunting and teasing were almost unbearable. The false rumors that she was already sexually active with several male classmates were humiliating. She was overwhelmed by the daily harassment, and finally, her teachers intervened. Their investigation pinpointed one girl as the source. The reason: both girls were interested in the same boy. According to 2010 U.S. Department of Justice data, bullying is not uncommon: as much as 20 percent of children ages 2 to 17 were victims of bullying at least once within the previous 12 months. Nearly 10 percent of children were assaulted chronically. A Duke study seeks to answer why certain children are targeted and to identify the long-term effects of victimization. In a seven-year longitudinal study, Moffitt and her colleagues followed 2,200 identical and fraternal twins in the United Kingdom (U.K.) from ages 5 to 12. The research revealed that physical characteristics –weight, hair color, etc. – don’t necessarily play into how a bully targets victims. Instead, bullies often choose children who seemingly have few close, warm relationships with adults and are less likely to report the abuse. Through home visits and questionnaires, the team also determined while emotional and mental health difficulties can factor into a child being targeted by a bully, being bullied itself can spark a new set of problems. A recent study conducted by Arizona State University published in February’s Child Development, however, contradicts this assessment. The paper reported depressed children attracted bullies, but further victimization didn’t worsen their depression. Moffitt’s data demonstrated the opposite. Among twins where one was bullied and the other not, the bullied sibling was more vulnerable to depression and anxiety. Following twins gave her team the advantage, she said, because they could control for genetic – as well as environmental – factors, and the Arizona team couldn’t. The team is also interested in how repeated victimization affects individuals into adulthood. Beginning in May, they have a £3 million grant to follow this same cohort through to age 18, looking not only at their mental health, but also their psychosocial adjustment skills and any stress-related biomarkers. To date, existing research examining the incidence of bullying among twins has included mainly middle-class families recruited through newspaper advertising. Instead, Moffitt’s team used the U.K’s twin registry to identify a sample group that more accurately reflects the characteristics of children who are most frequently victimized. To assess how children in the study responded to bullying over time, nurses conducted two-hour, in-home visits when the children were ages 5, 7, 10, and 12. They also collected birth weight, breastfeeding history, and vaccine records through a questionnaire at age 2. The nurses observed mother-and-child interactions during each visit and used two puppy puppets – Iggy and Ziggy – to ask the child questions designed to discover whether the child has been victimized. For example, one puppet asked, “Sometimes bigger boys make me cry. Do bigger boys sometimes make you cry?” Children either answered verbally or touched the puppet with which they identified. Other games pinpointed whether the child could view situations from another’s point-of-view. In addition, 100 families participated in a laboratory study that measured the twins’ levels of the stress hormone cortisol during an oral math quiz and discussion of their most recent traumatic event. Results revealed that children who hadn’t been bullied experienced an initial cortisol spike, but levels normalized within 45 minutes. However, bullied children didn’t have as high a cortisol rise, but the stress hormone lingered in their bloodstream beyond 45 minutes. The child’s emotional state wasn’t the nurse’s only focus, though. They also monitored and took notes on how the mother talked about her child. They focused on the mother’s tone of voice rather than what she said – for example, did she call the child “a pain” in a warm voice or with disdain? This collected data was coded and helped the team identify children who were less likely to have supportive, close relationships with their mother, putting them at greater risk for victimization. In the long run, Moffitt said she hopes this research will be used to increase awareness among adults about bullying, as well as increase the availability of emotional and social support services for bullied children and their families. As a surgeon, Robert Feezor, M.D., never expected he would eat earthworms at work. But as a father, he was thrilled to have the chance. Accessible child care is one of the things that can add to the workplace attractiveness of an academic medical center. Baby Gator opened its on-site facility two years ago, joining other academic medical centers that have offered the same benefit—some for as long as 50 years. Many, including Yale and Stanford universities, have housed child care near hospitals and clinics for decades. According to Sarah Bunton, Ph.D., AAMC research director of organization and management studies, longer hours of operation, close proximity to the hospital or clinic, and the possibility to see a child during the day make on-site day care a priority for faculty—both male and female. Baby Gator Director Pamela Pallas, Ph.D., said it was the medical school’s dean who first requested a location closer to the hospital. Within six months of opening, Pallas said, the center was at full capacity with112 children. There is now a waiting list 200 children long. On-site child care is so popular, and the need for quality services so great, that parents scramble to put their children on waiting lists before birth. Some even make the attempt before conception. Jane Grady, Ph.D., associate vice president for human resources at Rush University Medical Center, once had a faculty member contact her upon getting engaged to ask if it was too early to put a yet-to-be-conceived child on the waiting list. While the question amused Grady, who served as the first director of Rush’s Laurance Armour Day School, she was not surprised. Day care facilities at academic medical centers are more likely than other child care centers to have an educationally focused curriculum, making them a good choice for parents who already value extensive academic training, she said. Facilities on medical center campuses are also more likely to have highly educated staff. During the 2008 presidential election, Feezor’s children learned about the various candidates and flags from different countries. When they learned about gardening, his 3-year-old enjoyed showing off the watermelon every time Feezor picked him up on the playground. From the faculty perspective, paying for medical center-connected on-site day care can be easier than paying a center in the community, Grady said. Faculty can often choose from payroll deduction, using their health savings accounts, or monthly check. Although these centers are coveted and provide an appreciated benefit to faculty, starting a day care facility is not always simple, said Phillips Kerr, director of compensations and benefits for the University of Massachusetts Medical Center-Worchester, which opened its facility in August 2010. The biggest stumbling block is finding an adequately sized space, as well as the funds to complete renovations, hire staff, and purchase necessary resources. In fact, he said, the best option could be outsourcing the day care’s administration. For 30 years, the number of overweight children has crept higher and higher. In 2008, the Centers for Disease Control and Prevention reported 10 percent of children ages 2 to 5 had an unhealthy body mass index. Those children have a 70 percent chance of being overweight or obese adults. Establishing good health habits early can reverse this trend and help children have healthy lives. The UNC Gillings School of Global Public Health leads the fight against the obesity epidemic and promotes healthy behaviors locally, nationally and globally. Society’s advice to expectant mothers historically has been to “eat for two.” However, contemporary research shows that eating unhealthy, high-calorie foods during pregnancycan put children at risk for weight struggles and health complications before they are born. For 15 years, Anna Maria Siega-Riz, PhD, RD, nutrition and epidemiology professor and associate dean for academic affairs at the School, has analyzed prenatal nutrition data to determine which health habits give children the best start in life. Although most women know to limit weight gain during pregnancy, 60 percent still gain more weight than they should, based on Institute of Medicine recommendations. (Siega-Riz was a member of the prestigious IOM panel that developed those guidelines, available at http://tinyurl.com/iom-guidelines.) Fewer than 25 percent receive guidance from their doctors about physical activity. Making and maintaining behavioral changes is difficult unless women have positive, consistent support. Siega-Riz’s team uses the Internet, podcasts, chat rooms and cell phones to provide health information and online support for pregnant women. One podcast includes a skit in which four women, all at different parenthood stages, advise an expectant mom about choosing nutritious foods. Women with healthy habits may avoid having a baby who is too large for gestational age (often leading to C-section births), prevent shoulder dystocia for the baby during birth, and limit the child’s risk for developing diabetes and obesity. Choosing healthful foods during pregnancy could reduce the burden of chronic diseases later in life, says Mihai Niculescu, MD, PhD, nutrition assistant professor. Whether the “fat gene” exists is debatable (see page 14), but Niculescu’s epigenetic work – research that determines how outside influences alter our DNA – shows that high-fat diets and maternal obesity in mice alter DNA, shutting down some genes and accelerating others. Developmental brain delays in offspring are the result. When maternal obesity exists, the neurons in mouse fetal brains at 17 days of pregnancy appear less developed, according to Niculescu’s observations. The implications are worrisome, he says, because the effects are evident after three or four generations. Open the hangar –here comes the airplane! 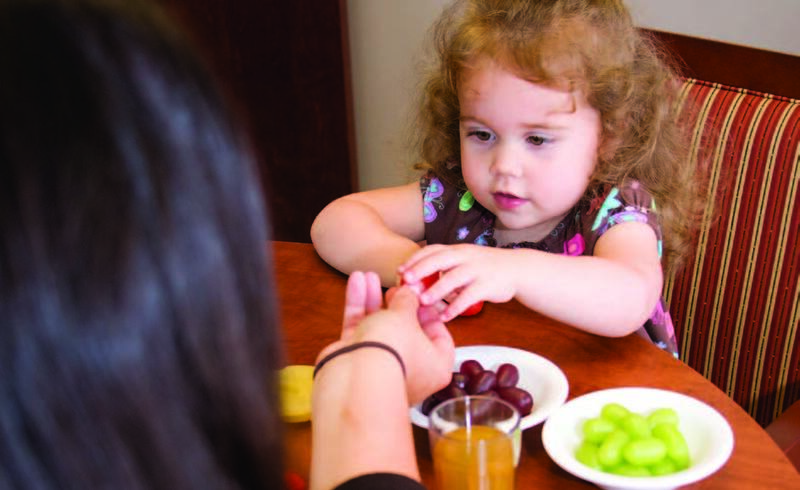 Karina Agopian, research assistant at UNC’s Nutrition Research Institute in Kannapolis, works with a toddler to determine what and how much the child has eaten. Research shows that early eating habits influence later food preferences and health outcomes. what increases obesity risk in children under two. In 2002, Associate Dean Bentley became a pioneer in this area when she launched “Infant Care, Feeding and Risk of Obesity,” a study of strategies used by first-time African-American mothers to feed their 3-month to 18-month-old children. With National Institutes of Health funding, Bentley recruited 217 mother-child pairs in North Carolina through the Women, Infants and Children program and videotaped them at three-month intervals to identify feeding styles. She and her team identified five styles: controlling, laissez-faire, responsive, pressuring and restrictive. Responsive mothers, she says, are “perfect moms” who pay close attention to and correctly interpret child cues of hunger and satiety. They are very engaged during feeding and may provide verbal and physical encouragement and help, when needed. Other styles pressure or even force children to eat when they reject food or overly restrict the quality and quantity of what children eat, often because the mother is concerned about her child becoming fat. Meghan Slining, PhD, nutrition assistant professor, analyzed data from Bentley’s study while she was a UNC doctoral student. Overweight infants – those who measured greater than the 90th percentile for weight versus length – were nearly twice as likely as normal-weight infants to have delayed motor development, Slining found. Add a mother with an eating disorder to the mix, and feeding a child becomes even more complex. Jordan Distinguished Professor of Eating Disorders Cynthia Bulik, PhD, used data from the Norwegian Mother and Child Cohort Study, which followed more than 100,000 Norwegian mothers, some of whom had anorexia or bulimia nervosa or binge-eating disorder, to determine how they fed their children. Bulik followed the mothers from 17 weeks’ gestation through their children’s eighth birthdays. Although some mothers with eating disorders experienced a reprieve from their conditions during pregnancy, this was not universally the case. In fact, a surprising number of women developed binge-eating disorder during pregnancy. Eating disorders during pregnancy expose babies to erratic eating, Bulik says. Mothers with eating disorders also abandoned breastfeeding earlier than did healthy mothers, Bulik says. After giving birth,women with eating disorders often feel they no longer “have a reason to be overweight” and choose not to consume adequate calories to support breastfeeding. Bulik’s study also shows that, as these children grow, they are more likely to develop eating problems, such as having stomachaches, vomiting without cause or not enjoying food. According to Miriam Labbok, MD, Professor of the Practice of maternal and child health and director of the School’s Carolina Global Breastfeeding Institute, a breastfeeding baby will “stop when full,” but bottlefeeding can overpower a baby’s ability to recognize satiety. When a parent insists that the baby empty the bottle, the child learns the habit of overeating, Labbok says. Additionally, breastfed babies are exposed to the tastes of foods eaten by their mothers. For a formula-fed child, food flavors are new and strange, which could cause the child to be a picky eater. Employing research to instill good eating habits early is paramount to changing the course of human health, Bentley says. DURHAM — Surprising as it may seem, the umbilical cord blood of babies born today can have traces of industrial chemicals that were banned 30 years ago, a report says. Their bodies can absorb at least 287 toxic chemicals while they are still in the womb. Ken Cook is president and co-founder of Environmental Working Group, a nonprofit research and advocacy group. He was in North Carolina last week and discussed results of blood tests his organization conducted in 2004 on 10 American babies. Ken Cook, president and co-founder of Environmental Working Group, presented environmental toxins research at Duke University in early April. that industrial pollution begins in the womb. Although these substances are present in the blood in minute levels, no research exists, he said, to show even small amounts aren’t dangerous. Cook presented his findings in a lecture co-sponsored by Duke University’s Nicholas School of the Environment and Earth Sciences and the Comprehensive Cancer Center. The partnership brings together researchers to study links between environmental pollution and public health. The EWG test identified 212 chemicals and pesticides, including DDT; 28 waste byproducts produced by incinerators; and 47 other substances found in products containing nonstick surfaces such as Teflon or stain shields such as Scotchgard. Many contaminants are known carcinogens, are associated with birth defects, or can negatively affect hormones, Cook said. Rebecca Fry, an assistant professor in environmental sciences and engineering at UNC Chapel Hill, said the EWG’s study is an important first step, and it calls for larger studies to establish the relationship between environmental contaminants in newborn blood and health outcomes. It is known that certain environmental contaminants contribute to problems such as low birth weight. Christina McConnell, who is 24 weeks pregnant and has an 18-month-old son, said she was shocked by the number of chemicals found in cord blood and was concerned there is no foolproof way to avoid passing harmful chemicals to her unborn child. “It’s surprising that some of these chemicals could have a big impact even in such small amounts,” she said. At the end of a hospital hallway in a dimly lit room, a tired, grief-stricken family huddles close to the bedside of the patient, a husband and father. They listen intently as the doctor tells them the chemotherapy and radiation treatments have failed to eradicate the cancer, and there is nothing more that can be done except to make the patient as comfortable as possible. Whether the disease is cancer or another fatal condition, hundreds of thousands of people die slowly each year, a nightmare no family wishes to undergo. Even when a patient’s condition is terminal, physicians are still responsible for the patient’s quality of life until he or she succumbs to the illness. In recent years, with the growth of hospice care, more and more families expect doctors to demonstrate good faith efforts in end-of-life care, also known as palliative care. Across the United States and Canada, several medical schools and researchers have implemented palliative education programs and outlined the characteristics of effective, compassionate end-of-life care. Students at Mount Sinai School of Medicine in New York learn palliative care methods at the Hertzberg Palliative Care Institute while University of California-San Francisco (UCSF) students study at a new symptom management and palliative care program at the school’s Comprehensive Cancer Center. Dr. Meier is also a professor in Mount Sinai’s geriatrics and medicine department, as well as the director of its Center to Advance Palliative Care. The Hertzberg Institute, which received original funding from the Project on Death in America, integrates palliative care instruction through all four years of medical education in the geriatrics and adult development department. As part of the program, students spend increasing amounts of time with dying patients each year. During the first and second years, students studying hematology and oncology interact with patients experiencing sever illness, learning how they cope and what they need to be comfortable. Patients who are physically able to speak to classes and tell them about their experiences, both good and bad, with hospital care. Third-year students complete a mandatory rotation, including six lectures outlining palliative care fundamentals. They form small groups, emphasizing role-playing activities that they discuss later with a faculty member. J. Andrew Billings, M.D., associate professor of medicine at Harvard University, agreed that providing instruction in proper palliative care is essential throughout medical education. Dr. Billings works in palliative care at Massachusetts General Hospital. Often medical students and practicing physicians indicate they are uncomfortable treating dying patients, Dr. Billings said. Some doctors worry ill patients and their families receive substandard care due to the physician’s lack of confidence. The Hertzberg Institute has taken additional steps to give students more assurance and enhanced palliative education. Fourth-year students can choose to participate in an elective rotation with the Palliative Care Consultation Service. Students see patients first and evaluate them before passing along a review and recommendation to the attending physician. In addition, beginning this month Dr. Meier said Hertzberg will initiate a new fellowship program for post-graduate hematology-oncology students interested in becoming dually qualified in palliative care. The fellowship provides one-on-one mentoring with national palliative care experts, as well as opportunity to provide care in a variety of settings, including ambulatory center, hospices and nursing homes. Training students to specialize in palliative care could relieve primary care physicians of palliative care physicians of the palliative care responsibility and improve service for dying patients, Dr. Meier said. Tending to the needs of these few patients sometimes puts a strain on the limited time physicians have. A team of researchers at the University of Toronto conducted a three-month experiment in 2002 that focused on improving palliative care methods by concentrating on patient comments and needs. Jeff Powis, a fourth-year Toronto medical student, led the project to help physicians improve palliative care based on patient requests for better pain management or symptom control. During the experiment, Powis functioned as a liaison between 36 families and their physicians, relaying questions, concerns and desires. He said it was his job to ake sure families felt their voices were being heard and to keep doctors aware of patients’ comfort needs. By asking patients to prioritize what three things they needed most, such as help with daily activities or improved access to nurses, Powis said he truncated the time doctors spent trying to discover what the patient needs from 30 minutes down to only a few. The three-month trial determined end-of-life care is better when it focuses o patient requests. Patients and families want someone to listen to their concerns and take action to relieve pain and stress, so teaching students to listen to patients is the most important aspect of palliative care instruction, Powis said. But effective end-of-life care does not rest solely on physicians. It must be a combined effort of everyone involved in healthcare. Peter Singer, M.D., University of Toronto professor of medicine and director of the school’s Joint Centre for Bioethics, agreed. The days of shuffling dying patients to the end of a hospital wing have passed, and the time has arrived for doctors, hospital administration and hospital health workers to join in palliative care. Toronto is not alone in its efforts to improve palliative care with hands-on involvement. On July 1, UCSF opened the doors to a collaborative effort between its Cancer Center Program in Symptom Management and Palliative Care and the UCSF Comprehensive Cancer Center. The partnership, involving students, a pharmacist, a nurse and a social worker, will share the responsibilities of controlling symptoms and managing pain. The original cancer center program, known as the comprehensive care team, only functioned as a consultative and advisory group for physicians. Social workers skilled in psychological assessment, communications and support meet with the patients, helping them secure home care services if they need it. But they also discuss the patients’ emotions about dying and try to open communication channels between the sick and their families. Not everyone involved with end-of-life care is ready to sing the praises of palliative care teams. Some observers believe such groups are detrimental to the movement that advocates greater palliative care training. Palliative care teams that focus on end-of-life care are hindering the push for palliative care education across the medical industry, said Kerry Bowman, Ph.D., clinical ethicist at Mount Sinai Hospital in Toronto and professor at the University of Toronto’s Medical Joint Centre for Bioethics. Establishing these groups undermines the need for all physicians to have these skills. Michael Rabow, M.D., principal investigator for the UCSF collaborative effort between the Cancer Center Program in Symptom Management and Palliative Care and the UCSF Comprehensive Cancer Center. palliative care skills, said Michael Rabow, M.D., the UCSF program principal investigator. This exposure will also help them face their discomfort with patients who are beyond the reaches of medicine. Palliative care education should exist on two levels, he said. Every physician should have a basic understanding of how end-of-life care can best serve patients. Because the medical community has put a major emphasis on a “good death,” Dr. Rabow said palliative care should also become a specialty, giving patients the opportunity to choose a palliative care expert as they approach death much as they would select a cardiologist for heart surgery. Before beginning any palliative services, UCSF program participants assess the patients during any treatment they receive to find out what additional services they might need, such as sessions with a social worker. Palliative care can be much more effective if the groundwork is established early rather than postponed until death becomes inevitable, he said. Patients also have the opportunity to express their emotions and frustrations through art. Rabow’s palliative care team includes a clinical artist trained to assist dying patients with their emotional needs. The artist, who is also a cancer center staff member encourages patients to articulate their feelings through pictures giving them a unique outlet to channel their fears. The Hertzberg Institute and the University of Toronto’s Joint Centre for Bioethics are part of a small cadre of academic institutions beginning to recognize the importance of improved palliative care in both countries. With too many students receiving far too little in this type of medical treatment, current practitioners must prepare the next generation of physicians to care for dying patients. While palliative care may not carry a high profile, dying with dignity is an important component of the medical ethos,” Dr. Bowman said. When Cheryl Pflueger’s contractions started four months before her due date, she traveled from her home in Brookings, S.D., to the Sioux Valley Children’s Hospital in Sioux Falls for preemptive steps that could halt early labor. The measures did not work, and Pflueger’s son Ben was born 16 weeks early, weighing 1 pound, 10 ounces. Doctors immediately put Ben on a respirator designed specifically for the smallest infants, and Pfleuger and Sioux Falls special equipment for premature babies and pediatric specialists saved her son’s life. For the next three years, Pflueger, her 2-year-old daughter and Ben drove the one-hour trek between their hometown of 15,000 people and Sioux Falls many times for Ben’s follow-up appointments with eye doctors, hearing specialists and physical therapists. Pflueger’s husband often could not take time away from work, so the family was frequently separated. Traveling for medical treatment created a financial burden, as well. Thousands of parents face similar problems each year when searching for healthcare for their children simply because they choose to live in less populated areas of the United States. The supply of general pediatricians is adequate and even growing in some parts of the country, according to several reports, but rural locations suffer from a scarcity of pediatric sub-specialists. And the problem is mounting. From 1978 to 2000, the pediatrician population ballooned by 140 percent, according to a recent study by Gary Freed, M.D., a professor at the University of Michigan School of Public Health. This increase means the number of pediatricians per 100,000 children more than doubled from 49.8 to 106.2 during the period. These doctors, however, are not spread evenly nationwide. Family practitioners often step in to fill th void left by a less robust pediatrician population in smaller cities. According to the study which was published in Pediatrics, pediatricians flock to more populated states, leading to high pediatrician-to-child ratios in select areas. For example, Massachusetts and New York have 165 and 154 pediatricians per 100,000 children, respectively. Inversely, South Dakota, Wyoming and Idaho have the fewest number of pediatricians per 100,000 children with 41, 35 and 28, respectively. Visits to pediatric sub-specialists jumped substantially, as well. Children visit pediatricians for roughly 4.5 percent of their appointments, an increase of 2.9 percent since 1980. The promise of higher income, more professional opportunities and increased social interactions drive pediatricians to settle in highly populated states. Dr. Freed said., leaving other states with a fraction of the physician workforce needed to effectively treat children. However, there is no data showing where pediatricians choose to locate. The shortage is often a result of uneven geography of pediatric education in medical schools. Between 10 percent and 15 percent of medical school graduates each year pursue pediatric residencies, but not all states offer programs in the field. For example, the University of South Dakota School of Medicine does not have a pediatric residency, prompting, on aver, five to seven of its 50 students to leave the state each year, according to Lawrence Fenton, M.D., chair of South Dakota’s pediatrics department. Most graduates do not return after completing their residencies, but individuals who do are often general pediatricians. Although South Dakota currently has 22 faculty members trained in various pediatric sub-specialty areas, between 15 percent and 20 percent will retire within the next decade. It will be difficult for South Dakota to entice younger specialists to come to a rural location when there is a desperate need for their services nationwide, Dr. Fenton said. Michael Anderson, M.D., chairman of the American Academy of Pediatrics (AAP) workforce committee, agreed. Despite the growing pediatric sub-specialist population, such doctors are likely to remain within or close to academic medical centers because that is where they receive their core support. This concentration is a roadblock to easy healthcare access and only exacerbates the shortage problem in rural areas. Because of the shortages, some children go without medical attention, Dr. Fenton said, and this problem because visible when a sub-specialist finally moves into town and is immediately swamped with patients. Attracting new pediatricians, especially sub-specialists, to smaller areas could continue to be a struggle, though, said Richard Pan, M.D., MPH, associate residency director of pediatrics for the University of California, Davis. Pediatric students find residency positions mostly at larger medical schools in urban areas, and approximately 40 percent stay in the area to practice. Salary is also a factor, Dr. Pan said, noting that pediatricians’ already low compensation makes moving to rural, less affluent locations even more unappealing. Other lifestyle factors contribute to the decision to stay in larger cities. Many residents consider their spouse’s career options, whether their children will receive a quality education in smaller city and the question of how a heavier workload due to fewer colleagues might affect their schedules. Marianne Felice, M.D., chair of pediatrics at the University of Massachusetts Medical School, echoed Dr. Pan’s thoughts, noting only a select few doctors can sustain the stress of being perpetually on-call because no other pediatricians are in town. Higher salaries and insurance reimbursement rates in large regions help to cover medical school debt, as well. However, Dr. Felice pointed out that it is likely that not all pediatricians counted in Dr. Freed’s study are currently treating many patients. Although they are all licensed physicians, some could be faculty members or researchers, thereby lowering the actual pediatrician-to-child ratio in Massachusetts and other states with a large supply of pediatricians. According to Scott Shipman, M.D., assistant professor of pediatrics at Oregon Health & Sciences University School of Medicine, budding pediatricians could have difficulty finding the job hey want in a larger city. The higher concentration means they may find themselves competing for a position they would not normally consider. There are, however, measures the medical community can employ to i,prove the supply of general pediatricians and sub-specialists in rural locations. Even though it is unlikely that scores of these physicians will choose to relocate in the next few years, medial treatment can still reach children through telemedicine, said AAP expert Dr. Anderson. Not all services will be available through this method, but it could alleviate part of the problem. Dr. Anderson said additional incentives are needed to entice new pediatricians to forgo a more affluent socially active lifestyle and practice in smaller locations. To draw more physicians in, hospitals could offer to pay off medical school debt if the pediatrician moves into the area. Just as medical schools contribute to the uneven geographic distribution of pediatricians by virtue of their location, the schools can also help turn the tide to increase sub-specialist supply in the more rural areas across the country, according to Dr. Pan. Discussing the needs of underserved communities and encouraging students to practice there is not enough to improve rural medical care. Medical schools must consider this issue at the admissions phase. For the past 10 years, at least, I’ve been going to the theaters during the holiday season, hoping to see a movie that recaptures the Christmas spirit I saw in films when I was a child. Needless to say, I’ve had none such luck. Lately, it seems that Hollywood no longer views Christmas as a time of good-natured cheer and family togetherness. Although I’ve thoroughly enjoyed both Harry Potter and both Lord of the Rings movies (as have many of you) they just don’t fit into the mold of what I grew up expecting from a holiday-time movie. But, this year is different. This year, I met Buddy. Buddy, played by former Saturday Night Live cast member Will Ferrell, is the central character of director Jon Favreau’s latest movie Elf. As an orphan who mistakenly climbs into Santa’s toy sack years ago, Buddy grows up in the North Pole, and despite his enormous size for an elf, epitomizes the warmth and good-cheer we expect from Santa’s little helpers. Perhaps best known for his striking impressions of President George W. Bush or his antics as Craig, the awkward, sweaty Spartan cheerleader, Ferrell manages to portray a beautiful child-lie innocence as his character travels via iceberg to New York City in search of hi birth father, Walter, played by James Caan. Caan is also well cast as a hardened book publicist, neglectful of his other young son Michael and none-too-thrilled with the prospect of bringing the “elf” he never knew existed into his life. At first glance, you may roll your eyes and groan, thinking this is another sappy, syrupy-sweet flick (though Buddy puts syrup on everything — including spaghetti) that runs the formula for a warn-hearted Christmas movie into the ground. But, it’s just not so. Ferrell’s grown-up spin on childish humor and the fact that we’re not left to languish on any sentimental moments sweeps both you and the movie along. Overall, though, the main draw of Elf is its child-friendly qualities. Though some mild crude language is interspersed in the dialogue and some toilet humor is included, the “offenses” are so minor that they almost slip right by you without even being noticed. Of course, if you have small children, you might want to think about for how many days they would find a very long, loud belch hysterical. The humor in this movie is simple. Buddy has never been in human society before, so he’s astounded by everything — cars, the tall buildings, revolving doors and even a coffee shop’s claim that it serves the “World’s Best Cup of Coffee.” Simple of not, Ferrell brings the humor alive on the screen in a way that is fun (and funny) for both kids and adults alike. Other than cartoon-type trips, falls and scuffles, there is no violence to speak of in this film. There is no gore, and the closest we get to bloodshed is the finger-prick Buddy undergoes to have a DNA test in the doctor’s office. There is also no home for sexual content in this movie. Buddy meets his love interest Jovie, an elf at the department store Gimbel’s where Buddy accidentally lands a job. We see one innocent kiss in the movie — and you can count on hearing no overt sexual innuendo. Now, don’t get me wrong, no movie is perfect. This one, despite its “feel-good” qualities does ask you to stretch the outer boundaries of your imagination a bit. Truly, what is the likelihood that an elf, who ultimately ends up saving Christmas could safely make his way to the Bi Apple on an iceberg? Is it possible for a human to survive on a diet of confections and still look not-so-bad in green tights? Favreau asks you to take a leap of faith to believe that Walter’s wife (Mary Steenburgen) would so gladly take in her husband’s illegitimate son and treat him as her own. But, for this movie, it seems to work, if for no other reason than you want it to. Ferrell and Favreau prove that you don’t need curse words or suggestive dialogue to entertain and transport your audience for an hour and a half. It can be done with a kind-hearted storyline and a sincere desire to recapture the wonderment you felt as a child during the Christmas season. Amidst the other epic tales on the big screen this year, those that depict war or struggles between good and evil or even those that strive to thrill rated-R audiences, Elf will assuredly be the bright, shining star. You can take your family to this movie and walk away smiling and feeling good about everything — I did.